Like a comet that flies through the night sky then disappears shortly after, Harry Nelson Pillsbury had a brief but awe-inspiring chess career. A savant with insane memorization and blindfold skills, Pillsbury had a meteoric rise. In 1895 at the young age of 22, he won the strongest tournament of his time, only to pass away 11 years later. Unfortunately we will never know how the record books may have been rewritten if he had lived longer. 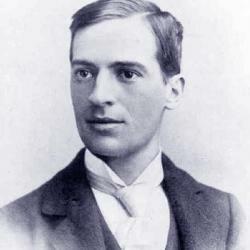 Harry Nelson Pillsbury learned to play chess in 1888. Two years later he beat a noted expert and two years after that he won a match against Wilhelm Steinitz who gave him pawn odds. In 1895, Pillsbury won the Hastings tournament ahead of all of the top players in his day including reigning world champion Emanuel Lasker, former world champion Steinitz, Mikhail Chigorin, Isidor Gunsberg and many other top players. Later, Pillsbury won the U.S. Championship in 1897 and continued to hold that title until 1906. It was in this year that he developed poor mental and physical health which ended up with him getting a syphilis infection. He was unable to live through the infection and passed away on June 17, 1906.